The U.S. Northeast from Washington to New England, including New York City, may be at risk from Hurricane Sandy by early next week. 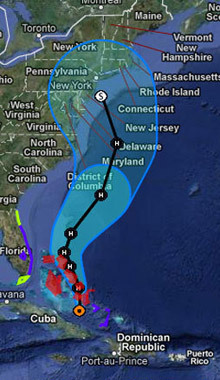 Sandy, moving north toward the central Bahamas with winds of 105 miles (169 kilometers) per hour, may hit anywhere from the mid-Atlantic states starting Oct. 28 to southern New England later in the week, depending on the track it takes, said Gary Best, a meteorologist for Hometown Forecast Services Inc. in Nashua, New Hampshire. Sandy crossed Jamaica yesterday and Cuba early today as it moved almost due north. The official hurricane center track shows it curving to the northeast into the Atlantic off Florida, then turning back to the north off North Carolina and nearing the coast of New Jersey on Oct. 30.